Can Prostaglandins Facilitate the Passage of Ureteric Stone Streets? 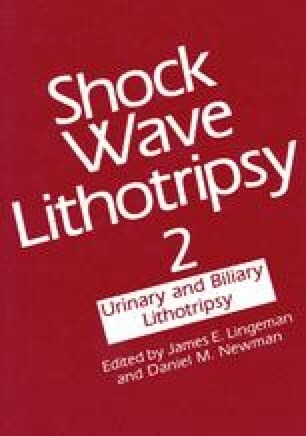 The impetus to this study arose from the belief that an agent introduced directly into the upper urinary tract, via a percutaneous nephrostomy tube, which consistently increased the contractility of the ureteric smooth muscle may facilitate the passage of established and obstructing stone streets arising from the disintegration of urinary stones by extracorporeal shock wave lithotripsy (ESWL†). At present it is difficult to predict which group of agents would fulfill the role of a ureteric inotrope. A study has been carried out on the actions of the prostaglandins E2 and F2 alpha and their synthesis inhibitors, indomethacin and diclofenac sodium, upon isolated human ureteric smooth muscle, using the technique of microsuperfusion designed to ensure good tissue viability. Indomethacin and diclofenac sodium were shown to abolish almost completely the contractile response of ureteric muscle to electrical field stimulation. Contractile activity, in the presence of the inhibitors, could be restored by prostaglandin E2 or F2 a1pha or increasing the external potassium concentration, [K+]o of the superfusate. Prostaglandin E2 or F2 alpha alone was shown to dramatically increase both the phasic and tonic component of the electrically stimulated contractions, on occasions inducing spontaneous activity. A possible mechanism of action was elucidated with an electrophysiological technique using intracellular microelectrodes. The mean membrane potential recorded was 54.7 mV (SD ± 10 mV, n=15). The depolarizing action of raising [K+]o was demonstrated and prostaglandin F2 alpha (3 × 10−6M) was shown to produce a small depolarization of the ureteric muscle cell membrane.